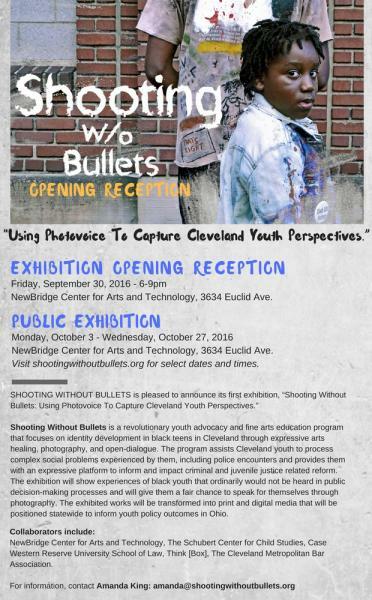 Shooting Without Bullets is a revolutionary youth advocacy and fine arts education program that focuses on identity development in black teens in Cleveland through expressive arts healing, photography, and open-dialogue. The program assists Cleveland youth to process complex social problems experienced by them, including police encounters and provides an expressive platform for them to inform and impact criminal and juvenile justice related reform. The exhibition will show experiences of black youth that ordinarily would not be heard in public decision-making processes and will give them a fair chance to speak for themselves through photography. By giving them a fair chance to speak for themselves through photovoice, we bridge the broader concerns and views of Cleveland youth with current efforts in our community to reform how police treat young people. Creative Director, Amanda King, will also present highlights from her policy brief that focuses on using photovoice to capture youth perspectives to inform reform processes. In the context of police reform, we often forget that black youth have important viewpoints and ideas to offer during critical discussions about issues directly affecting their lives. With a narrow focus on the perspectives of the “adults” in the situation, black youth voices are routinely rendered invisible. The exhibit will bring visibility to their issues and allow them to be agents of change in their community. Shooting Without Bullets would like to thank you for your support. Your contributions made a tremendous difference. Shooting w/o Bullets Opening Reception Friday, 9/30! 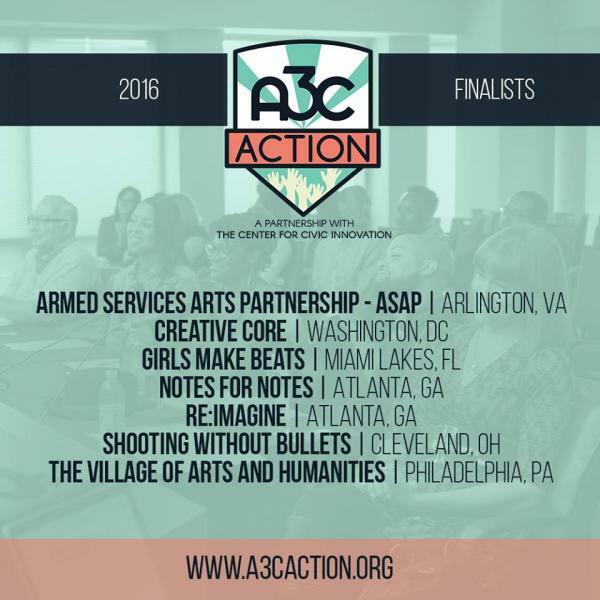 We're finalists for #A3CAction! On October 4-9, we will pitch Shooting Without Bullets in front of thousands at the 12th annual A3C in Atlanta! develop a youth photographer’s roll of film. 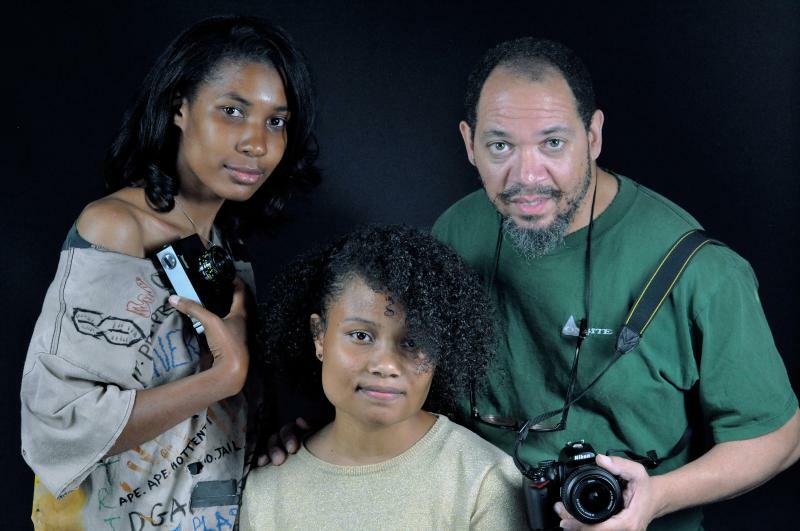 pay for a youth photographer to attend the preview and opening reception. get a catalog book printed. cover moving and construction costs of exhibition. for more information visit shootingwithoutbullets.org or email, Creative Director, Amanda King, at amanda@shootingwithoutbullets.org. Artists & Designers: We are inviting local artists to provide creative support and mentorship for our youth photographers. Volunteer Curators : Join our team of innovative curators to set up the preview and exhibition. In-Kind Contributions: We welcome donations of supplies and materials including old frames, mounting materials, and scrim. Eats: We are looking to partner with local food groups for small bites for the opening night. Your Voice: Help us spread the word about the exhibition! Your Presence: Attend one of our showings!